It would be very easy to write this movie off completely as big budget Manga gone wrong. However, if you have the patience, closer inspection reveals a movie that is spectacularly surreal, has some fantastic scenes with obvious voyeurism and Sapphic intent, as well as a couple of slices of reasonable martial action. On the down side the plot is transparent to the point of being 02, but if you are going to enjoy this film, don't even bother following the plot, it is obvious, contrived and in the end just gets in the way. (Basic) plot is thus: Utena, dressed far too much like a man from the batty boy Gestapo, starts the movie in a classroom full of students and a short skirted female student walks straight up to her. Said student gives out some serious body language action, but not saying anything flirty. From this first scene it's hard to determine if Utena is a teacher or student, and this isn't clearly revealed later in the plot either. From here, an introductory tour scene is created with a quick meander through the school. Axl Rose wannabe is actually dead, and he knew Utena when they were both in school together. He goes off back to the dead, and we find out that Anthy is imprisoned in the school, so they both break out after some pretty trippy, but beautifully created scenes which are definitely worth a look. 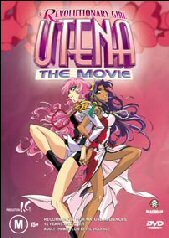 Movie then ends with Anthy and Utena finally succumbing to their lust for each other. So there are one or two things that deserve a mention about this. All the way through the film this is a small narration from two school girls on what is supposedly the school radio. This in itself is quite amusing as it is the voice of sanity in this film, and also helps bring some of the scenes into focus. Secondly, no matter how surreal some of the scenes are, there are some that make this DVD worth watching. Like the very opening scene, where there are a multitude of steel framed chalkboards gently traveling left and right creating a dreamy collage of motion. All in all, an interesting diversion from mainstream Manga, and one that has its gems if you can dig deep enough. 16:9 here widescreen here and it's all nice and clear. A good transfer and nothing significant to comment on. Dolby; English 2.0 and Japanese 2.0. English subtitles if required. All things said and done it was a bit odd that the sound wasn't in surround sound however all sounds are very clear and easy to make out. Director's comments, picture gallery, madman propaganda trailer, a trailer about the English voice over process and a brilliant little extra in this called Utena Trivia. Utena Trivia is a game, where you are shown a scene and you have to answer a multiple choice question about that scene. The doco on the English voice over process was amusing as the American voice over people make the process as complicated as possible on themselves when they do the voice-overs in my opinion!